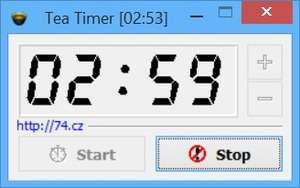 Tea Timer is a small program which really only has one function: to work as a countdown timer. As the title of this app may suggest, it can be used for counting down the time for steeping your tea. Tea Timer is a very basic application and as such is fully portable, meaning no need to install it. Just run the executable file and you've got yourself a digital tea time. Version 2.5.24.53 is a freeware program which does not have restrictions and it's free so it doesn't cost anything. For security reasons, you should also check out the Tea Timer download at LO4D.com which includes virus and malware tests. Additional screenshots of this application download may be available, too.